Jeff Allen has begun an interesting thread on ProZ by linking to a new article on his on machine translation post-editing (What is Post-editing?). According to Jeff post-editing of machine-translated text would permit to reduce translation time by up to 70%, while producing professional high-quality translations. In order to achieve such gains, a good procedure needs to be in place, so that the necessary terminological work be done before the MT stage. Furthermore,the post-editing should be done by a fully qualified professional. 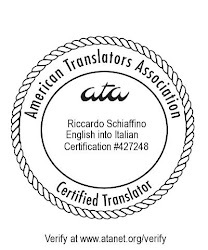 I think this is very important, as it points to a future in which MT translation becomes another tool (although maybe the most important one) in a professional translator's kit: just like, in the past twenty five years or so, our profession has been revolutionized first by the coming of the personal computer, and then by CAT programs. I am still somewhat reluctant to use machine translation. I have tried myself to utilize it, although, I must admit, the MT program I had was quite cheap and probably not suitable for the kind of tranlsations I do. The greatest obstacle for me is the fact that I love translating from scratch and don't like to edit other people's work including the work of a non-human translation program. Just my 2 cents. Where's your Atom feed, btw? My own experience with MT is fairly limited, although sometimes I do use a fairly simple program: I find that in certain limited domains (such as software documentation translation) it actually helps, at least when the SL is written clearly in fairly short sentences. I expect that more professional level programs, coupled with the kind of rigorous procedures that Jeff describes, would actually yield better results, at least in certian fields. BTW. I've now added a site feed... hope it works (I'm still very new at blogging). Yes, it works fine. Great. Thanks. I've followed up that thread on ProZ with several other postings in other ProZ threads concerning the use of MT and MT postediting. translation survey conducted in 2004 indicating that human translators average 2400-2500 words per day. On one project with a general text article of 6000 words, I maintained 1000 words per hour for 6 hours on postediting from English to French (going out of my mother tongue to near-native tongue) without any dictionary building. However, I wrote the source text, and so can be considered to be an expert subject matter expert on that topic. Newsletter, Issue 4. February 2005. English version: The Bible as a Resource for Translation Software: A proposal for Machine Translation (MT) development using an untapped language resource database. In Multilingual Computing and Technology magazine. Number 51, Vol. 13, Issue 7. October/November 2002. Pp. 40-45. Traduction: Une proposition de développement des systèmes de traduction automatique (TA) en utilisant une ressource linguistique inexploitée. A more recent project (beginning of 2006) to translate "legal contractual information", going from French into English. I completed 3392 words in approximately 5 "non-consecutive hours" of time. and there were sets of time constraints for the deadline. conducted in April-May 2005. More details on the results of this project (and examples of the source and translated texts) will be published as a conference paper or article. contained a total of nearly 75 different press releases which had been edited and demonstrated a high level of textual quality for translation purposes. 32 separate individual sessions were very carefully logged in an Activity log sheet (amount of minutes spent, exact start and stop times, location of activity, platform on which the task was conducted, output information). Text analysis, coding and test activity took a total of 1145 minutes (19.1 hours). postediting on the press releases that were sent through the MT system (with custom user dictionary attached). I'm sick and tired of "Lost in Translation"